We utilize state-of-the-art laboratory equipment in our own In House Laboratory where we can perform both common and emergency labwork. We are fully equipped for the wide range of Imaging Diagnostics with up to date technology in Digital X-Ray, MRI, CT Scan and Ultrasound. We utilize state-of-the-art laboratory equipment to facilitate identification of underlying health issues in order to help keep our animal companions healthy and happy. When our animal companions are in pain they can not tell us where they are hurting. 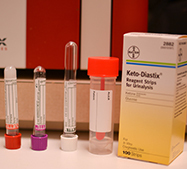 As a step toward establishing what is happening, we perform lab tests to help identify common concerns such as: dehydration, anemia, and infection to extensive concerns such as: kidney disease, liver disease, and pancreatitis. We are able to perform common labwork and emergency labwork with our in house equipment. The results are available to our veterinarians within approximately an hour. Certain labwork can only preformed by an outside laboratory. We utilize Idexx Reference Laboratory for this purpose. In 2009 we upgraded our radiology system to include the Eklin Digital D.R. Digital (Computerized) x-ray imaging has revolutionized diagnostic radiology and is considered the most significant breakthrough in x-ray imaging in the last 25 years. This technology enables our veterinarians to magnify and enhance images for improved diagnostic confidence. 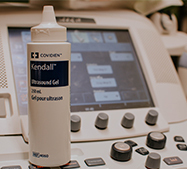 One of our important diagnostic tools is our Ultrasound machine. 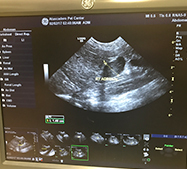 An ultrasound is a noninvasive way for our veterinarians to obtain an image of your pets’ internal organs. This enables the diagnosing of many health concerns including: certain cancers, pregnancy, intestinal foreign bodies, foxtails in abscesses, etc. 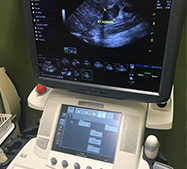 Dr. Cherbinsky, along with several of our veterinarians, has advanced training in ultrasound procedures. 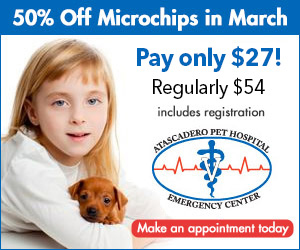 Atascadero Pet Hospital & Emergency Center is proud to be one of the few veterinary hospitals on the central coast to have an in house computed tomography scanner also known as a CT scanner or CAT scan. 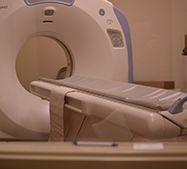 Our CT scanner is used to help diagnose internal medical conditions without using invasive surgery. A CT scan produces a series of images displaying the inside of the body by using a technology similar to x-rays and computer processing equipment to display both horizontal and vertical cross-sectioned sliced images. Instead of a single dimensional image, the CT scanner allows us to produce 3 dimensional (3D) images to better see and evaluate an effected area or organ without physically having to cut into the patient. A CT scan may be used to locate internal injuries, internal bleeding, internal masses, trauma, brain and spinal lesions, orthopedic injuries or masses. If your pet is scheduled for a CT scan, the process usually goes like so: Your pet is placed under full anesthesia (because they need to be perfectly still for the procedure) and monitored closely by our technician staff. The pet is then laid comfortably onto the gantry (table part of the CT scanner) and slowly passes through a large round device housing catscanpics equipment that rotates at 360’ around the patient to record images from every angle. The number of images depends on the pet’s particular situation. After our veterinarian has reviewed the images, the images are then sent out to a board certified radiologist to further expertly interpret. 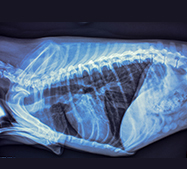 Once our Veterinarian and the board certified radiologist has reviewed the images produced from the CT scan, they will work together with you to determine the best course of treatment for your pet’s health regarding his or her condition.